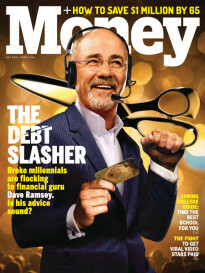 We’re not sure how “happy” April 15 is for you, but we’ll say it anyway: Happy Tax Day 2019! Fortunately, no matter if you dread Tax Day or look forward to a big refund, April 15 is not just the day when taxes are due. Tax Day has also become a day when restaurants and other businesses try to cheer customers up by dishing out freebies and food deals. Among the Tax Day deals you can take advantage of on April 15, 2019, are free cookies, free burgers, free sandwiches, and free massages, plus special discounts on pizza, smoothies, ribs, bagels, and more. Here are all the best Tax Day 2019 deals, including specials from major restaurant chains like Potbelly Sandwich Shop, Boston Market, Hardee’s, and White Castle. Download the B.Good app and you can get a free burger, or a free grain or green bowl, at B.Good locations from April 15 to April 20. Every customer at Great American Cookies can get a free original chocolate chip cookie on April 15, 2019, no purchase required. From 7 a.m. to 10 a.m. on April 15, 2019, participating Hardee’s locations will give you a free sausage biscuit if you say the words “made from scratch” when placing an order. Come in April 15th from 7-10 AM and enjoy a FREE Sausage Biscuit. Hot Dog on a Stick locations will give each customer a free turkey dog or veggie dog on Monday, April 15, no purchase required. Kona Ice trucks will be parked in cities all over the U.S. giving out free shaved ice to everyone on April 15, 2019. You can get a free hydromassage at Planet Fitness anytime through April 20. To get the freebie, you must enter your name and email and a coupon will be sent to you. The Tax Day 2019 deal at Bananas Smoothies & Frozen Yogurt is one free small frozen yogurt for all customers who ask, with no purchase or coupon required. On Tax Day 2019, BJ’s Restaurants are offering 50% off large deep dish or tavern pizzas. 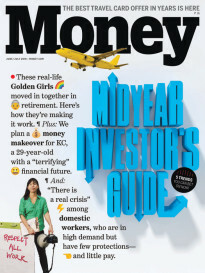 On April 15, 2019, Boston Market offers a special $10.40 Tax Day deal, which comes with a half chicken individual meal, two sides, corn bread, and a fountain drink. Here’s to hoping you get a solid tax refund! Save some of that new dough and enjoy a Half Chicken Individual Meal & drink for only $10.40 now until Tax Day. Sign up for the Bruegger’s rewards program and you can buy a Big Bagel Bundle — 13 bagels and two tubs of cream cheese — for $10.40 on April 15, 2019. It’s a savings of $3.50 off the regular price. Just say “1040” on April 15 at California Tortilla, and you’ll get free chips and queso with any purchase. 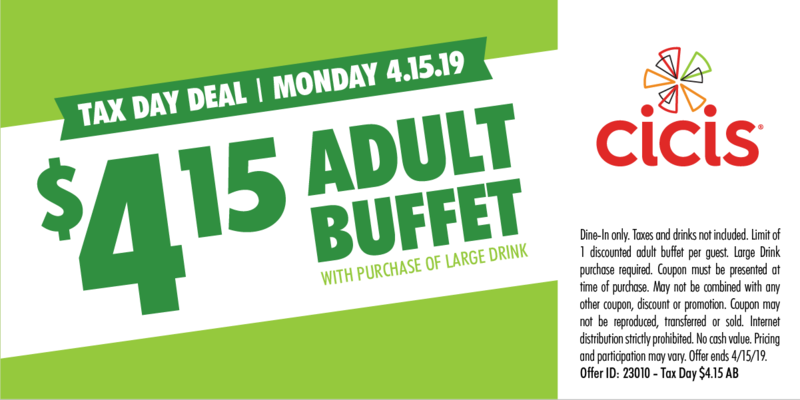 On Tax Day 2019, show this coupon at Cicis and you can get an adult buffet for $4.15. The purchase of a drink is also required. On April 15, 2019, at Farmer Boys, there are two special Tax Day deals: two breakfast burritos for $10.40, or two Double Big Cheese burgers for $10.40. 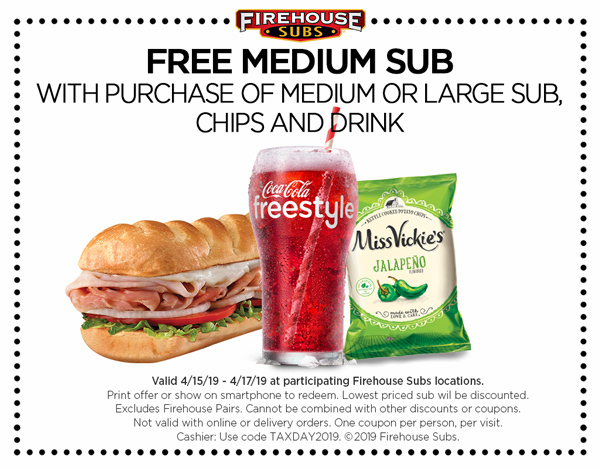 Show this coupon at Firehouse Subs anytime from April 15 to 17, and you can get a free medium sub with the purchase of a medium or large sub, chips, and a drink. Grimaldi’s traditional coal brick-oven 16-inch cheese pizzas are available at the discounted price of $10.40 each on Tax Day 2019. Kids eat free at Hooters on April 15 when accompanied by an adult spending at least $15 on food and drink. On April 15, you’ll get one free traditional cookie at Insomnia Cookies when you buy five other cookies. get 1  traditional cookie when you buy 5 traditional cookies! You can get $4 off any purchase of $10 or more by placing your order on April 15 through the Noodles & Company’s Noodles Rewards program or app. The travel site Orbitz will cover all of the taxes and fees on hotels and flight-hotel packages you book on April 15. Orbitz says its Tax Day deal can save you up to 25% off regular prices. Potbelly Sandwich Shop locations have a buy one, get one free sandwich deal for all customers on Tax Day 2019. To get your free sandwich at Potbelly on April 15, just mention that it is Tax Day to the cashier when placing your order. At the nine SAJJ Mediterranean locations in California, you’ll get $5 off any order placed through the restaurant’s Street Eats app on April 15. You can get a free small sandwich at Schlotzsky’s on April 15 with the purchase of a medium drink and chips. Thanks for joining #TheOGTalk! See you again next Thursday at 2 pm ET. *Don't forget to stop by for your #TaxDay relief on #April15th: A FREE small original with the purchase of chips & a medium drink! Place your order through the Smoothie King Healthy Rewards app now through April 18, and you’ll get $2 off any smoothie. Sonny’s BBQ locations have a Tax Day deal offering 50% off rib dinners on April 15. White Castle will give you 15% off any order on April 15, 2019, when you use this coupon.